A large enterprise (the Customer) has two data centers linked with a fully redundant layer-3 Data Center Interconnect (DCI) using an unspecified transport technology. Each data center has two redundant Internet connections (see Figure 1 for details). The customer would like to make the Internet connectivity totally redundant. For example: if both Internet connections from DC1 fail, the public IP prefix of DC1 should remain accessible through Internet connections of DC2 and the DCI link. All critical components of a redundant data center design should be redundant, but it’s sometimes easier to disregard the redundancy of the components not relevant to a particular portion of the overall design (our scenario: firewalls and DCI routers) to simplify the design discussions (see Figure 2). Redundant firewalls are usually implemented as active/standby or active/active pairs with stateful failover and appear as a single logical device to the adjacent hosts or network devices. Redundant DCI switches could also be merged into a single logical device using technologies like VSS (Cisco), IRF (HP) or Virtual Chassis (Juniper). The simplified topology thus accurately represents many real-life deployment scenarios. We’ll further assume that the two sites do not have significant campus networks attached to them. The outbound traffic traversing the Internet links is thus generated solely by the servers (example: web hosting) and not by end-users surfing the Internet. You can easily adapt the design to a mixed campus/data center design by modeling the campus networks as separate sites attached to the same firewalls or Internet edge LAN. 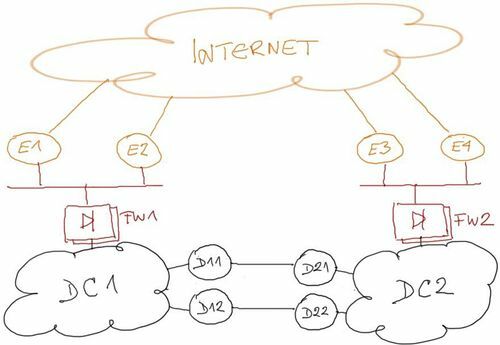 Optimal inbound traffic flow: Traffic for IP addresses in one of the data centers should arrive over uplinks connected to the same data center; DCI link should be used only when absolutely necessary. Optimal outbound traffic flow: Outbound traffic must take the shortest path to the Internet; as above, DCI link should be used only when absolutely necessary. No blackholing: A single path failure (one or both Internet links on a single site, or one or more DCI links) should not cause traffic blackholing. The design described in this document does not address a total data center failure; you’d need a manual or automatic failover mechanism addressing network, compute and storage components to achieve that goal. We can meet all the design requirements by redesigning the Internet Edge layer of the corporate network to resemble a traditional Internet Service Provider design. Edge routers connecting sites to the WAN backbone. In our network, upstream links and site subnets connect to the same edge routers. 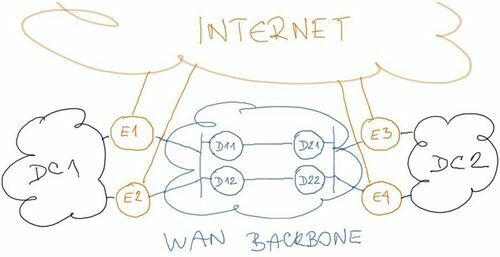 The missing component in the current Internet Edge layer is the WAN backbone. 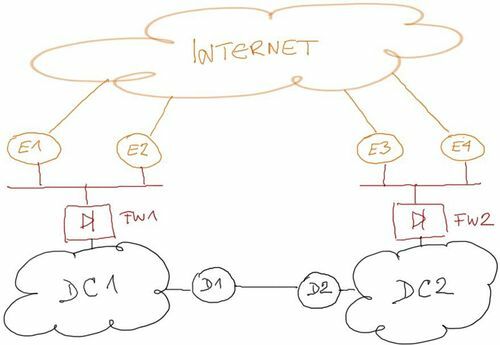 Assuming we have to rely on the existing WAN connectivity between DC1 and DC2, the DCI routers (D11 through D22) have to become part of the Internet Edge layer (outside) WAN backbone as shown in Figure 3. Virtual device contexts on DCI routers to split them in multiple independent devices (example: Nexus 7000). WAN backbone implemented in a virtual device context on Nexus 7000 would require dedicated physical interfaces (additional inter-DC WAN links). VRFs on the DCI routers to implement another forwarding context for the outside WAN backbone. Layer-2 solutions, where the DCI routers provide layer-2 connectivity between Internet edge routers, either in form of point-to-point links between Internet edge routers or site-to-site VLAN extension. GRE tunnels between Internet edge routers are just a special case of layer-2 solution that does not involve DCI routers at all. Layer-3 solutions, where the DCI routers participate in the WAN backbone IP forwarding.